Manual Gear Actuators feature a cast -iron housing with sintered bronze bearings on each end of the input shaft for durability and performance. 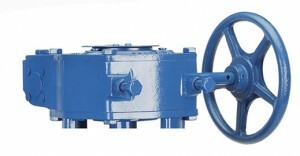 The ductile iron gear provides strength for robust applications and a long service life without maintenance. Manual Gear Actuators are available with hand wheel, chain wheel or a 2″ (50mm) square nut input option. All Manual Gear Actuators feature external position indication and are available with safety lockout devices.